Mindfulness is theorized to encourage a dispositional quality of nonjudgmental awareness that is incongruent with emotional and cognitive bias. 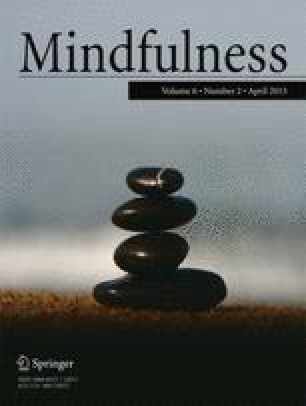 Recent empirical investigations offer evidence supporting the putative negative association between dispositional mindfulness and bias. The present study aimed to test the hypothesized negative relationship between dispositional mindfulness and extreme or biased self-theories with respect to implicit beliefs about the variability of personality and intelligence. One hundred sixty-three young adults completed a measure of dispositional mindfulness followed by a self-theories implicit association test. Results indicate that respondents with less biased self-theories reported higher levels of dispositional mindfulness relative to respondents with more biased beliefs about the variability of intelligence and personality. These findings suggest that mindful individuals may adopt less biased characterizations of the self and maintain self-concepts that are less influenced by past associations or preconceived notions. In each of the following tests, you will be asked to put words into categories, using the keys on your keyboard. Put your middle or index fingers on the Q and P keys on your keyboard. Words representing the categories at the top will appear one-by-one in the middle of the screen. When the item belongs to a category on the left, press the Q key; when the item belongs to a category on the right, press the P key. Items belong to only one category. The Q key indicates the category on the LEFT. The P key indicates the category on the RIGHT. Please complete this survey as quickly as possible. It is alright to make a few mistakes, but taking the survey too slow will lead to uninterpretable results. If you make a mistake, the item will not change until you correct the mistake by hitting the correct key. * Keep your index fingers on the “q” and “p” keys to enable rapid response. * Two labels at the top will tell you which words or images go with each key. * Each word or image has a correct classification. Most of these are easy. * The test gives no results if you go slow—Please try to go as fast as possible. * Expect to make a few mistakes because of going fast. That’s OK.
* For best results, avoid distractions and stay focused.